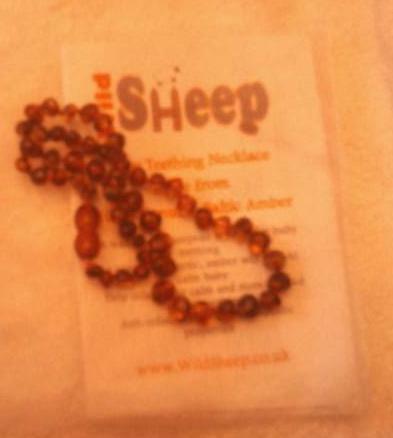 My Mummy's Pennies: Wild Sheep Baltic Amber Teething Necklace Review and Competition! 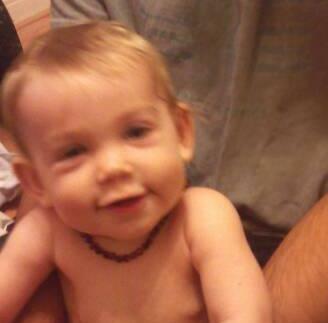 Wild Sheep Baltic Amber Teething Necklace Review and Competition! Competition now closed! And the very lucky winner is.... Bex (@OhNoItsBex)!!! Bex please email mymummyspennies@gmail.com with you contact details so I can pass them on to the lovely peeps at Wildsheep to have your prize sent out to you! Well as you may know My almost 10 month old daughter got her first tooth through today! It's been a long time coming as she first started to get teething symptoms back in April and at the time I thought those toothy pegs would be appearing any day! It was back then when I was first introduced to the idea of Baltic Amber. Another mummy revealed to me that when wearing his necklace her little one had actually had teeth come though without her noticing! The idea of something natural that would ease Elizabeth's pain and discomfort really appealed to me and within a few weeks Elizabeth has started wearing her Baltic Amber teething Anklet. She has now been wearing this everyday for over four months and not only does it look very pretty and attract some lovely comments, I really notice the difference in her when she's wearing it, compared to when I forget to put it back on after swimming or bathtime! 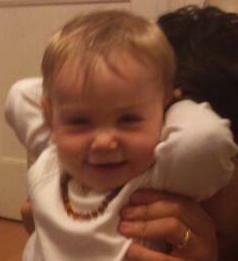 At the time I chose an anklet as I wasn't very confident about having something around the neck of such a young baby. A few weeks ago I was contacted by another company that sells Baltic Amber Jewellery asking if I would be interested in reviewing one of their teething necklaces. As Elizabeth is now older and I could see the discomfort from her swollen gums was growing I thought it was an ideal opportunity to see how she got on with wearing an Amber necklace. WildSheep is a family run business based in southeast Buckinghamshire. It was founded by a Brazilian and a New Zealander who decided to start WildSheep to sell baby products that are free from harsh chemicals and offer natural & organic alternatives for mums & babies. WildSheep make beautiful Amber Necklaces with authentic Baltic amber beads and 50/50 cotton & silk thread. Each necklace is unique and knotted between each bead, so if the necklace breaks only one bead will come off and the remaining beads stay intact. The screw clasp will also release if excessive force is applied, ensuring the highest safety. Genuine Baltic amber teething necklaces are a traditional European remedy for baby teething pain, which have been used for centuries. A natural analgesic, amber will help to calm baby without the use of over-the-counter drugs and remedies. Wildsheep's well layed out and simple to use website features Amber necklaces for both mother and baby in a wide selection of colours and 5 different lengths. They offer the beads in 3 styles, Split, Olive or Baroque. We were sent a 33cm Baroque Cognac Necklace for Elizabeth to wear. These necklaces are suitable for both boys and girls from 3-4 months of age onwards, and as teething can continue for 2 or more years, it is never too late for your child to start wearing Baltic Amber. It arrived in a lovely organza bag with an informative leaflet which included information on how to care for Baltic Amber Necklaces and the healing powers of Baltic Amber. The necklace itself was a lovely deep brown colour with smooth round beads. The clasp is made up of two plastic beads, one of which screws into the other, and it is strong enough to withstand a firm tug but will release if excessive force is applied, ensuring the highest safety. The beads were small and smooth, warm to the touch and are double knotted in between each one so if it was to break only one bead would be released. Elizabeth has been wearing the necklace for a few weeks now (only during the day, with it being around her neck we remove it at night unlike her anklet which is secure inside the leg of her babygrow) and it doesn't seem to bother her, she doesn't try to play with it or pull on it as I thought she may. The colour of the necklace is lovely but personally I think it would would be more suited to a brown eyed darker haired baby rather than my blond, blue eyed daughter! I also think that this lovely bold Cognac colour would be great for Mummies who want to try baltic amber on their little boys but are worried that 'jewellrey' may look a bit girly! As for the soothing and pain relieving properties, Elizabeth has been having teething symptoms for a few months now and she doesn't seem to have suffered much more in the last few days while her first tooth has been emerging through the gum. She has also been drooling a lot less! I like to think that the Baltic Amber has has a part to play in easing her pain and keeping her (relatively) calm! I would recommend Baltic Amber teething necklaces to any Mummies looking for a natural alternative for teething pain relief. Wildsheep have a great selection on their website at great value prices! The necklace we were sent costs just £12.99 plus P&P which is really good value considering how much it could save you on teething gels and powders! Check out their full range of gorgeous necklaces at http://www.wildsheep.co.uk. Don’t forget to visit their Facebook page and “LIKE” them to receive the latest news about competitions, freebies and new products! The lovely ladies at Wildsheep have generously offered one Mymummyspennies reader the chance to win one of their beautiful Baltic Amber Teething Necklaces! Facebook is no way affiliated with this competition. If the winner does not contact me within 3 days of their name being chosen another winner will be drawn. Competition will close 9pm 30th September 2011. - I have liked both Wildsheep and Mymummyspennies on facebook. - I have registered for their newsletter. 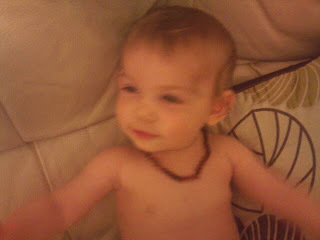 - My favourite product from the site is the teething necklace - just what I need as my lil girl is teething. I have liked both MyMummiesPennies and Wildsheep on Facebook as Rebecca Smith. I follow your blog on GFC as Bex.